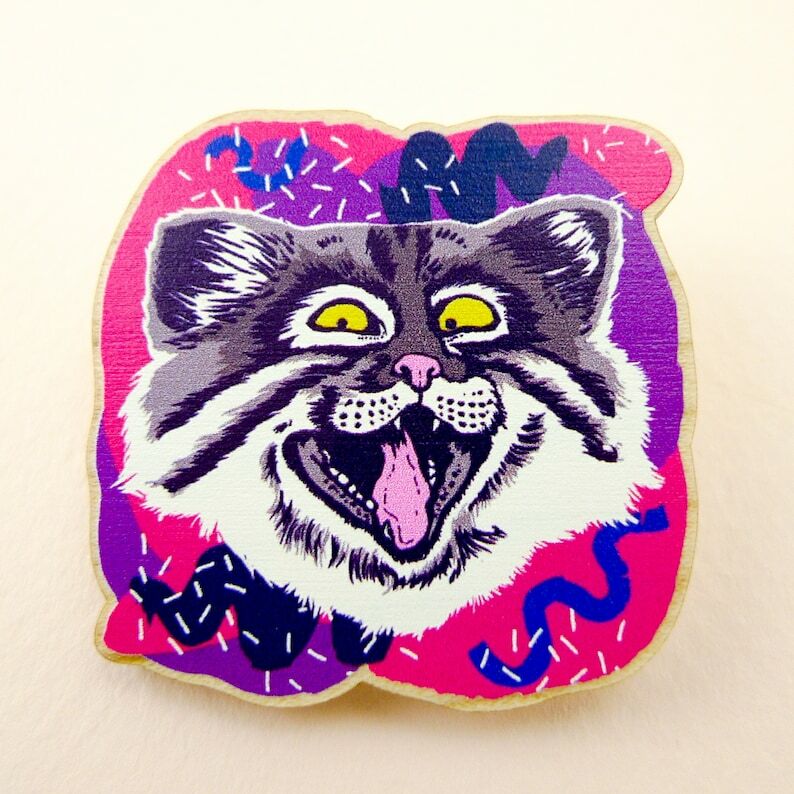 The Pallas Cat pin is simply exploding with positive energy. Can you even handle this amount of cuteness? Have you ever seen a Pallas Cat? I urge you to watch a couple videos if you haven’t. At first glance, these megafluffy creatures might look like fat felines, but their coat is protection against the harsh climate of central Asia. More importantly, they have the most expressive face ever seen on a kitty! I’m pretty sure this Pallas Cat is planning surprise parties all day long. Be prepared to hear ”SURPRISE!” every now and then when you’ve pinned this guy to your shirt! The Pallas Cat pin is printed on maple wood and securely fastened to a pin back. The wood has a really wonderful, faint scent of tar and smoke, that instantly grabs you and takes you to the wilderness…. 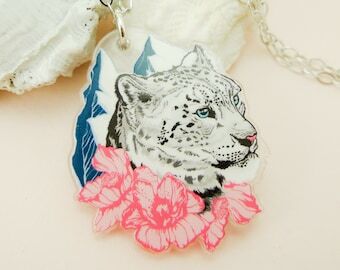 Attach the Pallas Cat pin to your jacket, shirt or purse, you are ready to conquer the world! 3. We have a full 30-day money back guarantee and no-hassle returns, in case you change your mind! Designed and assembled in Fort Lauderdale, Florida. Printed in Austin, Texas. Ships from Fort Lauderdale. We have a FREE, no hassle 30-day return policy on all our products. It is possible that any order from the USA will be checked by your country's customs officials and YOU MIGHT BE SUBJECTED TO A CUSTOMS FEE and taxes for the goods! Customs Duty is a tariff or tax imposed on goods when transported across international borders. The amount is different in each country, so make sure you CHECK BEFORE ORDERING so you're not in for an unpleasant surprise! This is too cute😂Love those smirking eyes. 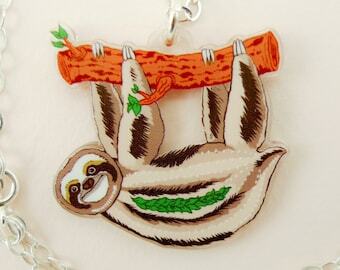 And thanks for the extra sloth. I absolutely love my brooch. In person the colours are stunning and the size of the brooch is perfect. Thankyou to the seller for the lovely brooch and note that came with it. I couldn't be more happier with it. 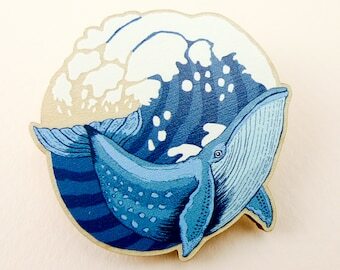 My best friend loves manatees and reading, so this pin was just too perfect! It was a birthday gift and she was so happy! 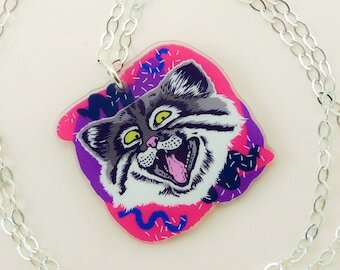 This pin combines a few of my favorite things! Too cute! Depends on my current workload, but please ask for more info! Just ask and we can wrap your item at no additional cost. Yes, go ahead and ask me! What material are the chains and metal parts? The chains are all 100% sterling silver. The clasps, split rings and other small metal parts are also sterling silver or in a few cases sterling silver filled*. 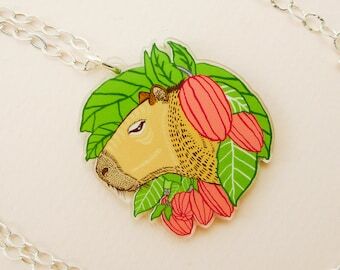 The only exception is pin backs – they are made from nickel-plated brass, since they don't come into contact with skin in the same way as necklaces and earrings. The findings are supplied by a reputable US-based wholesale company. If you have more questions, please contact us. What material is the jewelry made of? 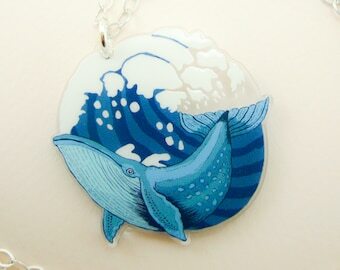 We use clear and colored acrylic for our necklaces and earrings. We also use maple and alder wood. The material is mentioned in each product description. We want to make sure you keep your jewelry looking its best! Here are our tips on how to care for your precious pieces. Keep your jewelry in its original box and store in a cool, dry place. And (this might sound like a no-brainer, but I speak from experience… ) try to remember to remove your jewelry before showering, jumping into the pool, going into the sauna or sleeping! Keep water, perfume, sprays and other liquids away from your jewelry. Wooden jewelry DOES NOT LIKE GETTING WET – wood is an organic material, and extra care should be taken to protect it from moisture and extreme conditions. Don’t keep your jewelry loose in a purse with, for instance, your keys, as the printed parts can get scratched. That being said, if normal precautions are taken, your jewelry will last a long time looking good as new. Use a soft, moist cloth to clean your jewelry. This will help to remove any fingerprints and dust, and keep your pieces looking as good as new. Please don’t scrub violently, submerge in water or use harsh cleaning agents.